Made specifically to greatly simplify assembly and disassembly for these bolts - especially if the spring is stiff or your hands are greasy. Work as follows: Turn extractor clockwise. Insert pliers and tilt toward rear of bolt to clear extractor from bolt groove. Now turn pliers and slip off both pliers and extractor spring. Encircle bolt with pliers and squeeze extractor collar closed firmly. Slip extractor onto bolt collar, remove pliers. Now grasp pliers under extractor as shown and force lead edge up and clear of bolt face. Slide extractor rest of way onto bolt, then rotate into groove. SPECS: 6" (15.2cm) long. Blued steel. Laget spesielt for å forenkle sammen montering og demontering for disse boltene - spesielt hvis våren er stiv eller hendene er fet. Strikkes slik: urviserne extractor. Sett inn tang og vipp mot baksiden av bolt fjerne extractor fra bolt groove. Nå slå tenger og slip av både tang og komfyr vår. Omslutter bolt med tang og klem extractor krage stengt fast. Slip extractor på bolt krage, fjerne tang. Nå forstå tang under extractor som vist og tvinge bly kanten opp og klar av bolt ansikt. Skyv extractor resten av veien til bolten, og rotere i sporet. Spesifikasjoner: 6"(15.2 cm) lang. Blånert stål. IT'S A VERY SIMPLE AND EFFECTIVE TOOL THAT REALLY TAKES THE "FIGHT" AND SORE FINGERS OUT OF REMOVING AND INSTALLING MAUSER EXTRACTORS. I had a Yugo M48 Mauser with a stubborn extractor collar that made extractor removal and reinstallation very difficult by hand. After repeated unsuccessful attempts to get the extractor reinstalled, I purchased this tool and was able to get it installed in about a minute. If you own a Mauser pattern rifle, this tool is well worth it. Really nice, well built tool that functions as it should. A professional tool for professionals. 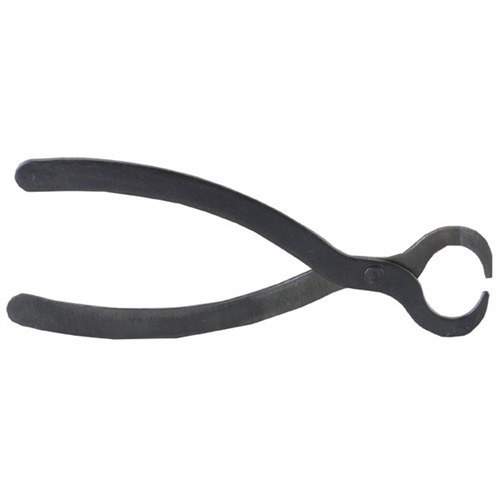 Bolt Extractor Pliers Laget spesielt for å forenkle sammen montering og demontering for disse boltene - spesielt hvis våren er stiv eller hendene er fet. Strikkes slik: urviserne extractor. Sett inn tang og vipp mot baksiden av bolt fjerne extractor fra bolt groove. Nå slå tenger og slip av både tang og komfyr vår. Omslutter bolt med tang og klem extractor krage stengt fast. Slip extractor på bolt krage, fjerne tang. Nå forstå tang under extractor som vist og tvinge bly kanten opp og klar av bolt ansikt. Skyv extractor resten av veien til bolten, og rotere i sporet.